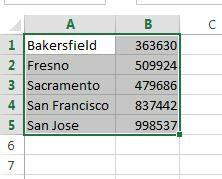 Produce a report with a column chart comparing 5 city populations in California using Excel and Word. Video #1 - Produce a column chart that will compares 5 cities in California using Excel. Video #2 - Write a report in Microsoft Word and insert the colum chart at the bottom half of the report. Have a paragraph that answers the questions below. What do the columns compare in the chart? Which city is closest in population to Fresno? Why do you think San Jose has the most people living there? Which city other than Fresno have visited and why did you go there?